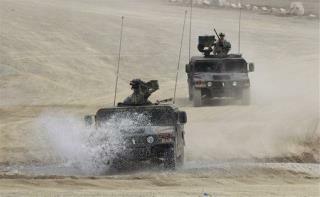 (Newser) – The US Army and Marine Corps are in need of trucks that can carry two to four troops at a time and that are tough enough to endure bombs and mines, but not so heavy that they can't be ferried by air—and Oshkosh just won the $6.75 billion contract to provide them, the Wall Street Journal reports. The Wisconsin-based company beat out Lockheed Martin and AM General to provide almost 17,000 new Joint Light Tactical Vehicles, or JLTVs—and perhaps as many as 55,000 over the next quarter-century—to replace the military's older fleet of Humvees built by AM General, the paper notes. The contract will also fuel thousands of jobs, per the AP. 17,000 is very interesting number. That's just about the same amount of helicopters that Johnson ordered up after the death of JFK in Dallas and Bell Helicopter got the main government contract for UH-1D to enter the Vietnam theater of war. He also ordered up more than 500 F-111 out of General Dynamics in Fort Worth. It's about time! Now all the military equipment that's left behind for the enemy to acquire will be even more desirable and formidable in use against us. And the best part of all is they won't have to pay a dime for it. We'll pick up the entire tab for them, because we're the United States of America - that's what we do! The Pentagon may as well proclaim "Let's ensure that our enemy maintains a healthy fighting force against us by utilizing their latest acquisition - our lost military equipment." oh good, another socialist public works project brought to you my the MIC.